The evaluation dartboard is a quick and simple method for participants to rate the delivery of a workshop, training session or similar activity. 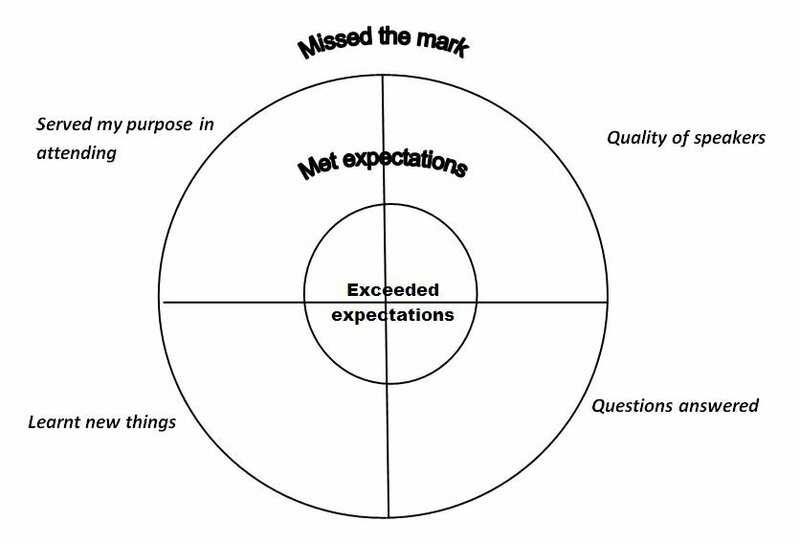 Participants, using sticky dots or a marking pen, make a mark on the dartboard based on a rating scale, for example from ‘highly satisfied’ to ‘highly dissatisfied’ or ‘exceeded expectations’ to ‘missed the mark’. 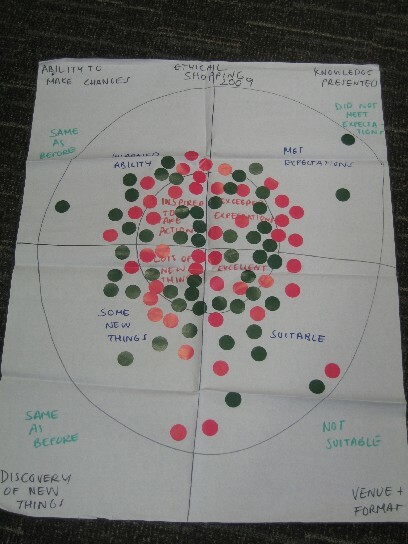 The dartboard provides a visual snapshot of participants’ views without the need for further analysis or work (for example, compared to questionnaires). An evaluation dartboard consists of drawing a large circle on a flip chart paper, a whiteboard or similar. You can then draw another ring in the centre of the circle to represent the bull’s eye, and one in between the centre and the outer ring. Participants are asked to place a separate mark within each sector that represents a question. The nearer the bulls eye, the more satisfied a participant is, and the further they are away from the centre, the less they are satisfied. This is presented in the diagram below. What you need to consider is whether the question makes sense with regards to the rating that you use (refer to designing a questionnaire). If you want more information, especially for variables that are rated low, you can invite participants to also write a small comment next to their mark that represents the reason for their low rating.